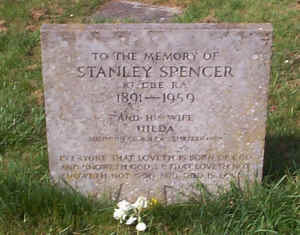 To Sir Stanley Spencer Cookham was "a village in heaven". It was in this Thames side village that he grew up happy and secure as a member of a large and talented family. Stanley's early life in Cookham was the well spring of his inspiration and the village itself was an important background for many of his paintings. Fernlea, especially at mealtimes, was loud with discussion and argument as Stanley's older brothers talked with each other and their parents. Stanley watched, listened and absorbed. Cookham, prior to the First World War, was a rural community somewhat cut off from the outside world. The village High Street contained not only a working forge, a baker, butcher and chemist but opposite Fernlea, Ovey's Farm, whose cows fascinated Stanley when he sat looking out from the window of his bedroom. His brother Gilbert wrote of the village in summer, with "the excitement of the regatta ending with the fair on Cookham Moor where everyone descended; the gentry and their ladies in their evening clothes joining in with the hoi polloi, Social barriers were down and the mix up was attractive and complete." The young Spencer loved and embraced it all. Recognition came early, culminating in a knighthood towards the end of his life. 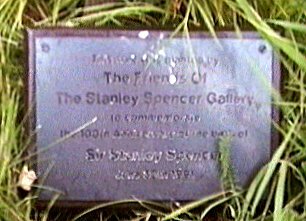 Stanley painted over 450 pictures and made hundreds of drawings, many of them set in and around Cookham. Often, his Cookham paintings were placed in scenes remembered from childhood. Others were painted out-of-doors, the artist, trundling his painting gear along on the old pram he used, was a familiar sight in the village. In particular he followed his own vision of biblical events taking place in Cookham, and thus created the wonderful series of religious paintings setting the New Testament story in and around the village. Cookham has greatly altered since Stanley's early days but it is still possible to see many of the settings of his paintings and even the views he recorded so well. We hope the following walk will add to your enjoyment of his work. A memorial stone can be seen in Cookham Church, next to a Judas Tree, planted by the Friends of the Stanley Spencer Gallery to commemorate the centenary of his birth. 1908-12 Student at the Slade School of Art under Tonks. Contemporaries included Nevinson, Roberts, Gertler, Bomberg and Paul Nash. 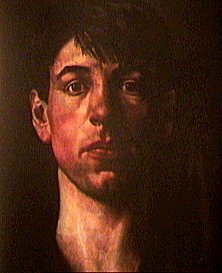 Awarded scholarship, 1910; Melville Nettleship and Composition Prizes 1912. 1912 Exhibited in Roger Fry's Second Post-Impressionist Exhibition, Grafton Galleries. 1915-18 Enlisted RAMC, 1915. Stationed Beaufort War Hospital. Posted to Macedonia, 1916. Volunteered for infantry, 1917. 1920-21 Lived with Sir Henry and Lady Slesser, Bourne End. 1925 Married Hilda Carline; two daughters, Shirin and Unity. 1926-30 Murals, based on wartime experiences in Bristol and Macedonia. 1927 First one-man exhibition at Goupil Gallery. Created a stir with The Resurrection, Cookham (1924-6). 1932-38 Lived in Cookham.1932 elected ARA. 1933 & 1936 Visited Switzerland at the invitation of Edward Beddington-Beherns. 1935 Resigned from Royal Academy after rejection of two paintings by hanging committee. 1937 Divorced by Hilda. Married Patricia Preece four days later, but separated almost immediately. 1940 Commissioned to paint picture of shipyards by War Artists' Advisory Committee, Finished Shipbuilding on the Clyde series, 1946. 1945 Moved to Cliveden View, Cookham Rise. 1945-50 Painted Port Glasgow Resurrection series. 1950 Awarded CBE; rejoined Royal Academy & elected RA. 1958 Retrospective exhibition: Cookham Church and Vicarage. 1959 Knighted June. Died on 14 December at Canadian War Memorial Hospital, Cliveden.